Enjoy a relaxing eco-tour led by one of our certified wildlife guides. You’ll be able to see many native species, some up close and personal. 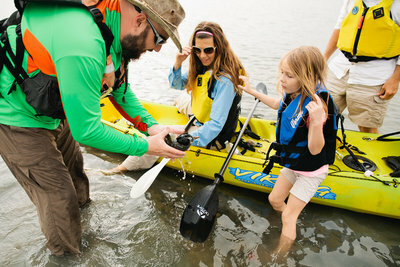 Kayaks are able to navigate quietly into the shallow marshes without disturbing the pristine marine habitat and are the perfect vehicle for a low-impact ecologically sound tour. In the cooler months you will be astounded at the numbers and variety of waterfowl and other birds that call this area their home. 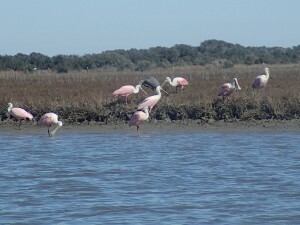 Roseate spoonbills, sandhill cranes, geese, ducks, and many more birds are easily found in abundance. Aransas county is home to the last wild flock of Whooping Cranes in North America. They nest here from Oct.-Apr. and kayaks offer a perfect way to view them. Kayaking is a great way to see the birds around Rockport. There are a variety of habitats to visit for paddlers of all skill levels, from beginner to advanced, and are ideally suited for youth groups, scouts, or for families and children.